The Cranes Are Flying (Russian: Летят журавли, translit. 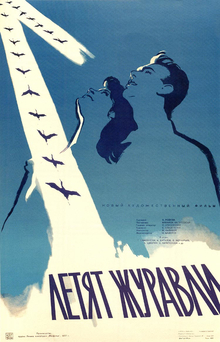 Letyat zhuravli) is a 1957 Soviet film about World War II. It depicts the cruelty of war and the damage suffered to the Soviet psyche as a result of World War II (known in the Soviet Union as the Great Patriotic War). It was directed at Mosfilm by the Georgian-born Soviet director Mikhail Kalatozov in 1957 and stars Aleksey Batalov and Tatiana Samoilova. It won the Palme d'Or at the 1958 Cannes Film Festival, the only Soviet film to win that award, although The Turning Point (1946) was one of eleven films awarded that year's Grand Prix, the predecessor of the Palme d'Or. Fyodor Ivanovich is a doctor who lives with his son, Boris; his daughter, Irina; his mother; and his nephew, Mark. The film centers on Boris's girlfriend, Veronika, during World War II.The character of Veronika represents Soviet women in the context of the aftermath of the aforementioned war. The call to war sounds, and the country responds with great patriotic fervor. Boris volunteers to defend his homeland from the attackers, much to Veronika's sadness. He is killed in a swamp, while saving the life of a fellow soldier. However, he is listed as missing in action; neither Veronika nor his family learn that he has been killed. The German blitzkrieg then begins; people take refuge in the subway system underneath the city. During one attack, Veronika's parents refuse to leave their apartment; when Veronika returns, she finds that the building has been bombed. The entire apartment is gone and there is no sign of her parents. Fyodor Ivanovich invites Veronika to live with his family. Mark, who has been pursuing Veronika, is put in charge of keeping her company to lift her spirits. He is obviously in love with her, but she continually rejects him, waiting for Boris to return. However, during one bombing raid Veronika refuses to go down to the shelter and is left alone with Mark. This scene is unclear, but it is implied that Mark rapes Veronika. She is then shamed into marrying him, and the rest of the family believes that she has betrayed Boris. The family is relocated with many other Russians further East to escape the German offensive. They live in a temporary community where Fyodor Ivanovich, Irina, and Veronika work in a military hospital. Mark spends his time partying and playing music; he and Veronika are both clearly unhappy in their marriage. One of the soldiers in the hospital becomes hysterical when he receives a letter saying that his girlfriend has left him; Fyodor Ivanovich admonishes the soldier to forget about her, since women who cannot wait for their men to return are not worth grieving. Veronika overhears the speech and becomes very upset, since she appears to be such a woman. Distraught, Veronika brings herself to a bridge and intends to jump in front of a rapidly approaching train. Just before she falls, she turns around and sees a young boy who is on the verge of getting hit by a car. She pulls the boy off the road, to which she learns that he is missing his mother and that his name, coincidentally, is Boris. Veronika decides to informally adopt the boy, and takes him back to the community home. Fyodor Ivanovich discovers that Mark's deferral from conscription was not because he was considered too talented to be drafted, as he has claimed, but because he bribed an official in Fyodor Ivanovich's name. Fyodor Ivanovich suddenly realizes that Mark has betrayed not only Russia, but the family as well, and has taken advantage of Veronika. Fyodor Ivanovich confronts Mark and kicks him out of the house, while Veronika is invited to stay and is forgiven by the family for "betraying" Boris. The man that Boris died trying to save comes in search of Boris's family to tell them the news. When Veronika finds out, she refuses to believe it, saying that Boris's friend Stepan, who volunteered with Boris, will know what happened to him. At the end of the war, when the soldiers return, Veronika finds Stepan and learns that Boris is indeed dead. Stepan sadly gives her a bouquet of flowers, and Veronika stumbles in tears through the celebrating crowd. However, the film ends on a hopeful note: Stepan makes a speech asserting that they will never forget those who died in the war, and Veronika hands out the flowers in her bouquet to the returning soldiers. As film scholar Josephine Woll observes, the protagonist Veronika was instrumental in shaping the post-Stalinist Soviet movies by heralding more complicated, multi-dimensional celluloid heroines. It was not only Soviet audiences that accepted and sympathized with Veronika‘s story. The lead actress of Cranes, the beautiful Tatiana Samoilova, who was frequently identified with her role, took Europe by storm. Following the film's victory at the Cannes Film Festival in 1958, where it earned the event‘s prestigious Grand Prize, the world celebrated the film‘s main protagonist. Woll notes that the French Liberation commentator, for example, approvingly contrasted Samoilova‘s purity and authenticity with that Western female icon, Brigitte Bardot. 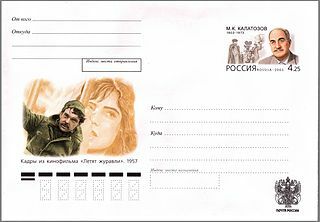 Samoilova even remembered receiving a watch from her East German fans during a festival there; the gift featured the inscription: "Finally we see on the Soviet screen a face, not a mask." The illustrated PSE with the scenes from the film: A. Batalov as Boris, T. Samojlova as Veronika. Russia, 2003 г. ^ "Festival de Cannes: The Cranes are Flying". festival-cannes.com. Retrieved 2009-02-10. ^ Josephine Woll, The Cranes are Flying (London: I. B. Tauris, 2003), 77. ^ Josephine Woll, Cranes, 77. This page was last edited on 29 October 2018, at 09:25 (UTC).